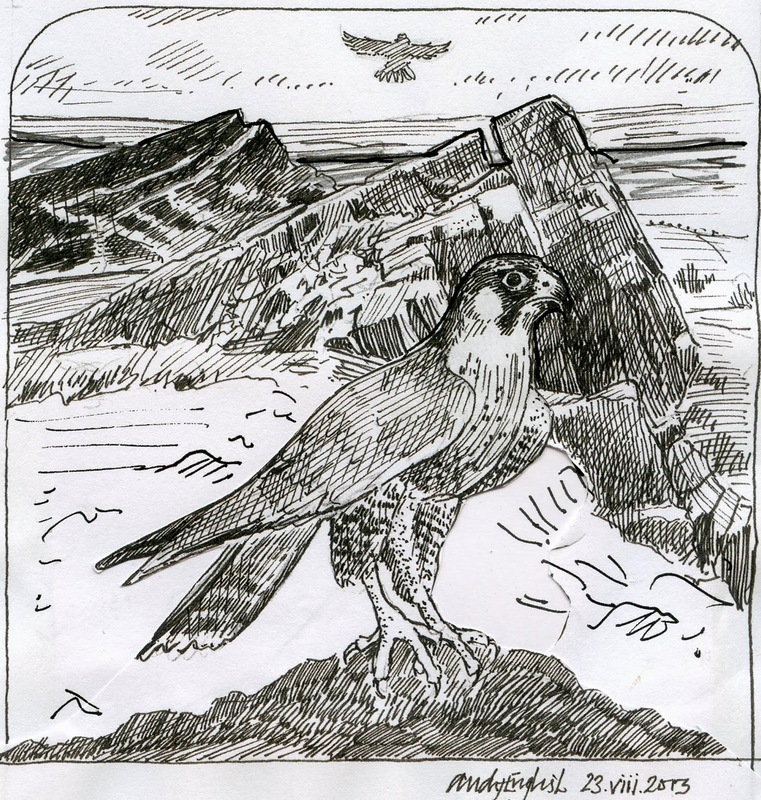 In the first of these two posts, I described the creation of a pair of engravings which featured wildlife in a Peak District setting - a landscape with a very different character from the low-lying flat lands in which I live. The third engraving follows a similar pattern. One of the most memorable events of my visit to the Peak District was to clamber up a ridge of rock called the Roaches. They are spectacular in themselves but I was keen to see the peregrine falcons that were nesting there. I was not disappointed. Most impressive was the speed at which they approached the nest when they took over parental duties from each other. I decided not to engrave a peregrine in flight. They have such a powerful presence when they stand and survey the landscape. That is what I wanted to attempt to capture. I started by making very rough sketches and then a more finished ink drawing. I added a silhouette of a second peregrine in the sky and, beyond the Roaches, I drew the shape of a separate hill called Hen Cloud. I consciously suggested the shape of the rock formations in the pose of the bird. "A Peregrine On The Roaches"
I have already described the making of the nine small blocks that make up "Peak Post". This was a way of including glimpses of the Peak District which had interested me but which, in themselves did not suggest a substantial engraving. I will add a reminder that the whole set of approximately forty engravings will be exhibited at many places in the Peak District during 2014 and that I will be demonstrating engraving and speaking about this experience at Gallerytop, Chatsworth Road, Rowsley, Matlock, Derbyshire. DE4 2EH on Saturday 12th April at the Private View, which runs from 12noon - 4pm. 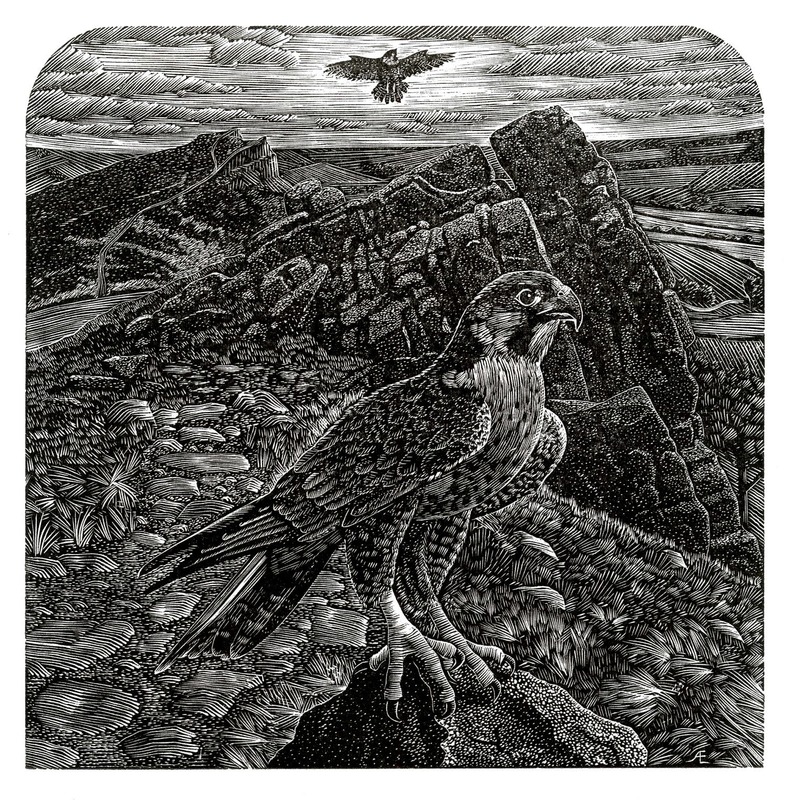 I was one of a dozen engravers who were invited to visit the Peak District and create wood engravings in response. I was part of a group who traveled there in early May 2013 and, over the next few months, I planned and engraved four prints. The whole set of approximately forty engravings will be exhibited at many places in the Peak District during 2014. I will be demonstrating engraving and speaking about this experience at Gallerytop Chatsworth Road, Rowsley, Matlock, Derbyshire. DE4 2EH on Saturday 12th April at the Private View, which runs from 12noon - 4pm. In this first of a pair of posts, I will show the development oftwo of the engravings. I enjoyed the grounds of Chatsworth House very much but found my inspiration in the extensive vegetable garden. I liked the sunny parkland stretching out beyond the stable block and, nearer to hand, I loved the terracotta rhubarb forcers. It was rather early for many vegetables to I decided to imagine those at a later date. I found this composition rather difficult. No matter how I arranged vegetables and forcers, I was unhappy with the result, which lacked focus. The answer came to me as I was walking round my own village. A hedgehog! They are a favourite mammal of mine and, although I saw no sign of one during my visit, I was sure that Chatsworth must have many hedgehogs scuttling about in the twilight. The last drawing is in ink and shows how I turned the stable block to make a more symmetrical image. The leeks make a small "avenue" along which the hedgehog has been moving. The engraving was relatively straightforward. The first proof pulled was rather flat and grey and so I had to make sure that I let enough light into the image by widening some of the engraved lines. Here is the finished image. I was particularly pleased with this engraving after the difficulty I had at the beginning. I had seen this heron on a walk along Dovedale the previous year and had been thinking about making an engraving so this was the perfect opportunity. There was no difficulty in this composition as I had a vivid memory of the heron perched on a dry stone wall, standing on one leg. The heron is on of my favourite birds and I have made three engravings - one large and two tiny. I was lookng forwards to adding a forth. Here is my original ink drawing. Having made it, I decided that I wanted to change the slope of the wall and so made the very rough sketch below it. As usual, I made an outline drawing in ink on the block. The cuts themselves are improvised as I work. I enjoyed engraving the stone wall. I tried to give each piece its own character, rather than use a formula throughout the wall. Here is the engraved block. Notice how the valley side behind the head is engraved right up to the bird. I was happy with many aspects of the print when I pulled the first proof but it seemed a little "flat". After much thought, it occurred to me to cut a circle of light behind the head. As soon as I took the next proof I was happy with the image. Who knows where inspiration comes from?